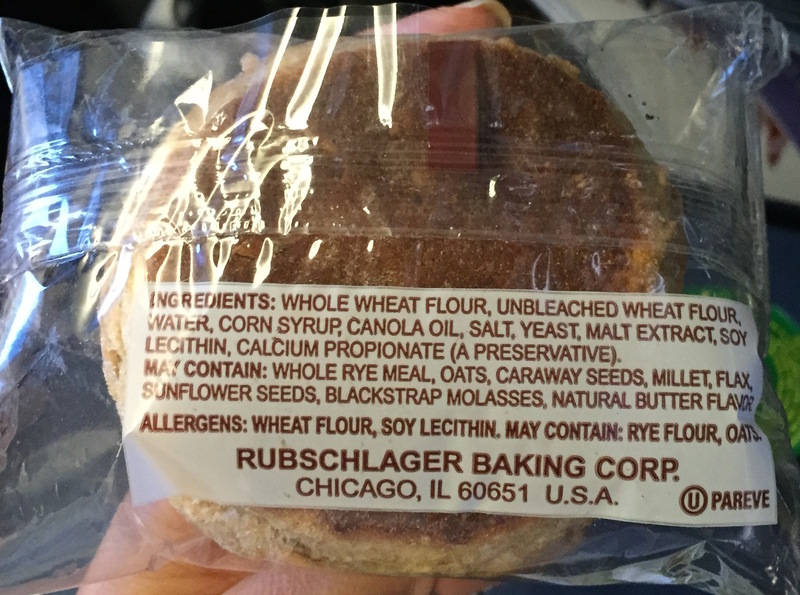 Last weekend, I ordered a diabetic meal on my flight from Washington to London, just to see what it would be like. 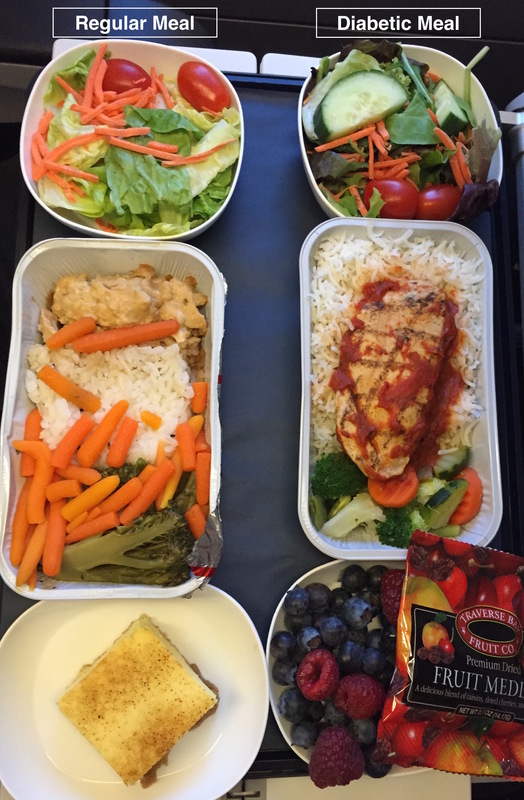 There are many less-than-ideal recommendations for diabetics from health establishments, ranging from hospitals to doctors to the media, and I wanted to see how they crystallised in this airplane meal. Other than the berries for desert, all the other components of my meal were worse for diabetics than the regular meal my fellow passengers were enjoying. The systemic failure in healing the diabetics of the world extends up to 36,000 feet. But before… Allow me a short recap! Type 2 Diabetes is a disease caused by too much consumption of carbohydrates (rice, wheat, potatoes, desserts, sugar, candy, fruit juices) over a few decades. As one ingests carbohydrates, they are rapidly broken down into simple sugars in our digestive system. These make their way into our bloodstream. The problem is, high sugar levels in our bloodstream is not great- our body wants to get rid of it as fast as possible before it causes problems. After exposing our bodies to insulin over and over and over again, over several years, we become desensitised to it. Trouble. Trouble. This is Type 2 Diabetes. Doctors treat it by prescribing more insulin to their patients so that they can keep eating carbohydrates without facing the risk of an uncontrolled high blood sugar. Unbeknownst to most patients, injecting insulin does not ‘cure’ the condition. In fact, it keeps the diabetes going and makes it worse. Overtime, diabetics needs to inject more and more insulin to counter their worsening pancreas depletion and insulin resistance. Even though on the surface, everything seems under control and injecting one-self has become a habit, keeping the diabetes going is a path towards a whole host of other problems (Cardiovascular disease, Alzheimer’s, blindness, amputation). The way to start reversing the progression of Type 2 Diabetes is to keep blood sugar levels steady and in the normal range by (among other things) reducing carbohydrate intake. Ok, so back to my experiment! 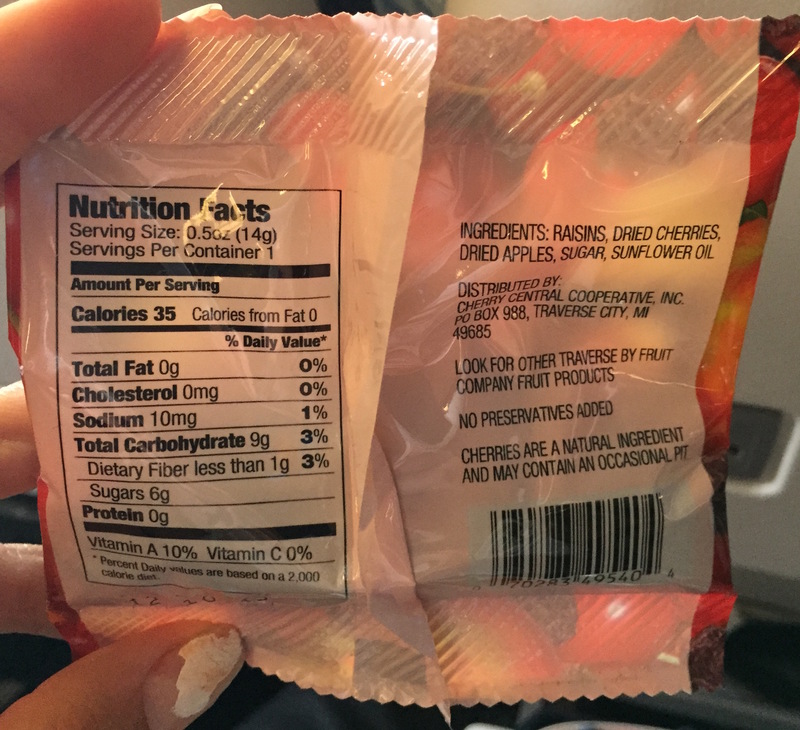 I compared the diabetic VS the regular meal on the plane. Salad: virtually identical- that’s fine, no bad carbohydrates in vegetables. Main course: both meals were based on chicken, but the diabetic version got no carrots, which is good, because carrots (especially boiled) can be very sweet. However, there was white rice in the diabetic meal, in fact, more white rice than in the regular meal. Rice is a simple carb and is sure to send my blood sugar through the roof. Corn Syrup. This is bad news for a diabetic. HFCS is a very potent sweetener made from corn, which will unnaturally spike blood sugar, necessitating a quick insulin injection to get it under control. Milk would have been much healthier for a diabetic, and full-fat milk even more so (anything with fat slows down the sugar absorption and subsequent rise in blood sugar). Then we come to “butter“: hydrogenated vegetable oils for me, with trans fats (even though it says 0 trans fats per serving). Trans fats are known to be a cause of CVD. 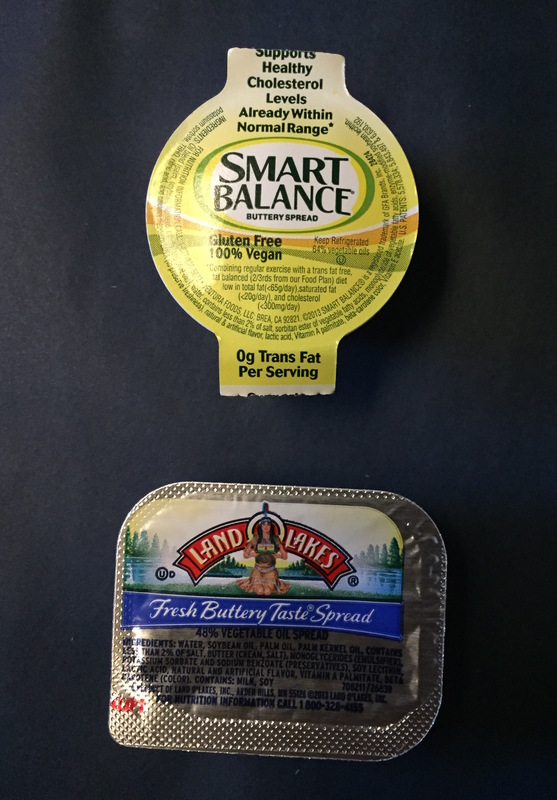 The regular meal presents a slightly healthier version, which contains some small quantity of butter and no trans fats (because no hydrogenated oils). In terms of heart health, which is a concern for diabetics, the regular-meal spread would have been better. The salad dressing: The diabetic meal included a salad dressing with High Fructose Corn Syrup as the first ingredient! I was starting to wonder if they were doing this on purpose… British Airways, are you trying to keep diabetics diabetic? And why a fat free dressing? Fat is an ally for diabetics, it helps curb rises in blood sugar. At equal ingredients, adding fat to a food will slow the rise in blood sugar. Fat is good, sugar is bad. Here, i got a dressing with no fat, and a ton of sugar. Precisely the opposite of what is healthy. 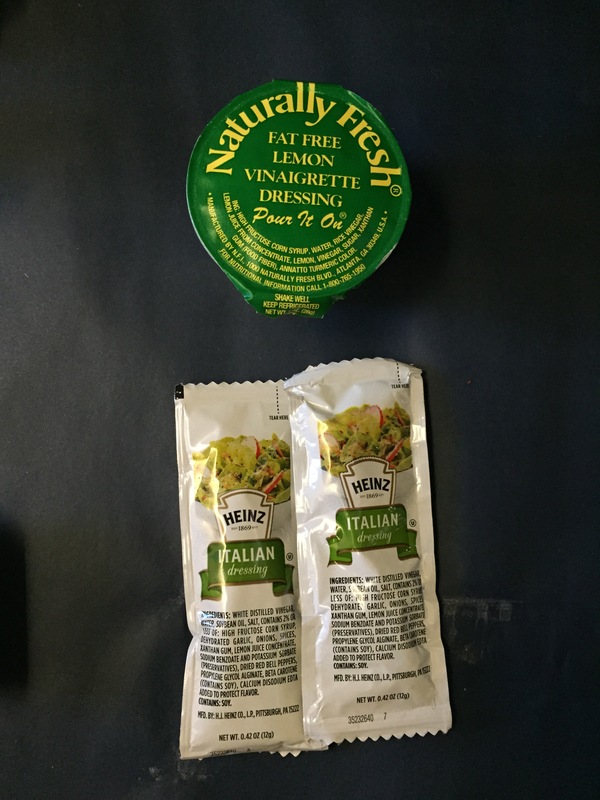 The italian dressing from the regular meal (which still contains HFCS, but less than 2%) would have been much better. 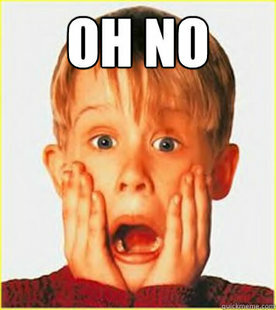 The diabetic meal was accompanied of a bread with….. Corn Syrup! Again! Dessert. The cake from the regular meal would be very bad for a diabetic, so the bowl of berries was a good alternative (if you are going to eat fruit as a diabetic, berries are the best option since they are the lowest in sugars). However, I also got a strange ‘Fruit Medley’ pack, made of dried fruit sweetened with added sugar. That is a big no-no and is precisely the kind of food you should avoid as a diabetic. Dried fruit and sugar are no better than the cake from the regular meal. Rapidly absorbed simple carbohydrates. If you are a diabetic, you would expect that requesting a special meal would give you something better for your health condition than the regular option. Unfortunately, the special “diabetic” meal contained more carbohydrates and sugars than the regular meal. These are sure to keep a diabetic sick, and to contribute to the progression of the disease. The diabetic meal was also lower in fats- an issue again, because eating fats helps curb blood sugar spikes. Why the diabetic meal had more High-Fructose Corn Syrup than the regular meal… That is a mystery. And it makes ZERO sense. Despite confusing guidelines, it’s very much recommended that High-Fructose Corn Syrup should be avoided by diabetics. Furthermore, why are diabetics told to stay away from fat (which will not raise their blood sugar by anything) and are told to continue eating carbohydrates (which keeps them sick and sends their blood sugar through the roof)? Is keeping diabetics sick and dependent on insulin a way for Big Pharma to insure profits, and a way for Big Food to keep selling processed products? Needless to say, this meal baffled me. 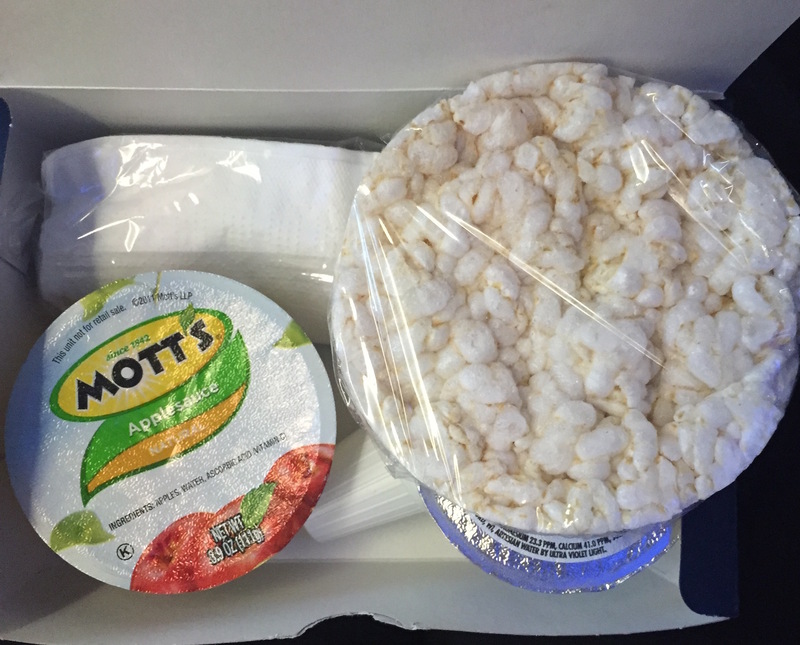 To add insult to injury (at this point, I was laughing), they gave me a rice cake and apple sauce for my snack. That’s pathetic! Extra corn syrup in the bread! What could they be thinking!! BTW, there’s a better way to add fat to your diet besides pouring it on directly. That way is to up your intake of soluble fiber and resistant starch. This feeds your friendly gut bacteria which in term will turn that fiber and undigestible starch into very short chain fatty acids. Ce post est top, tu as eu une excellente idée, bien joué ma chérie! Wow that is really shameful!! Talk about a blood sugar spike. Jeez. You’re 100% correct about the insulin recommendations by doctors– it just prolongs the insulin use!! I saw a TED talk about this just the other day. 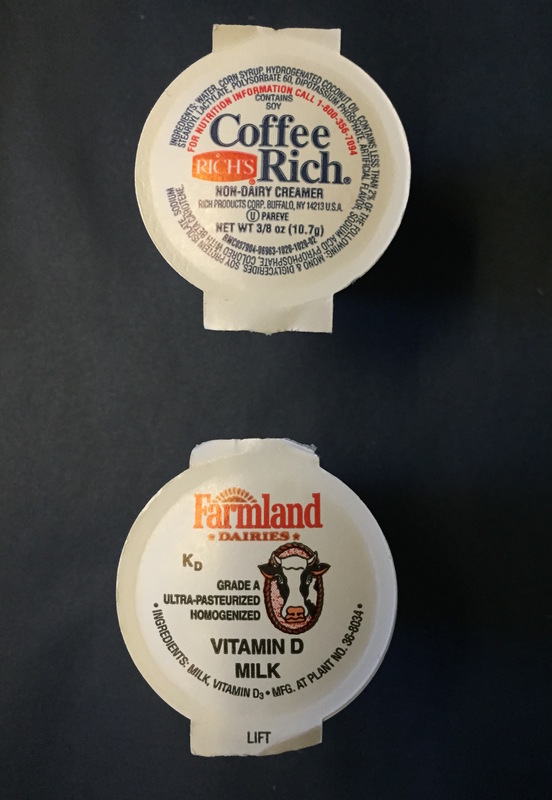 We make enough glucose necessary to survive naturally from any dairy that is taken in. We don’t need additional glucose from carbs and the fact every doctor and diabetic educator I’ve met thus far recommends additional carbs to be taken in each meal just exacerbates the development of insulin resistance. Thank God for natural remedies like Gymnema Sylvestre, Chromium Piccolinate, and Nopales! 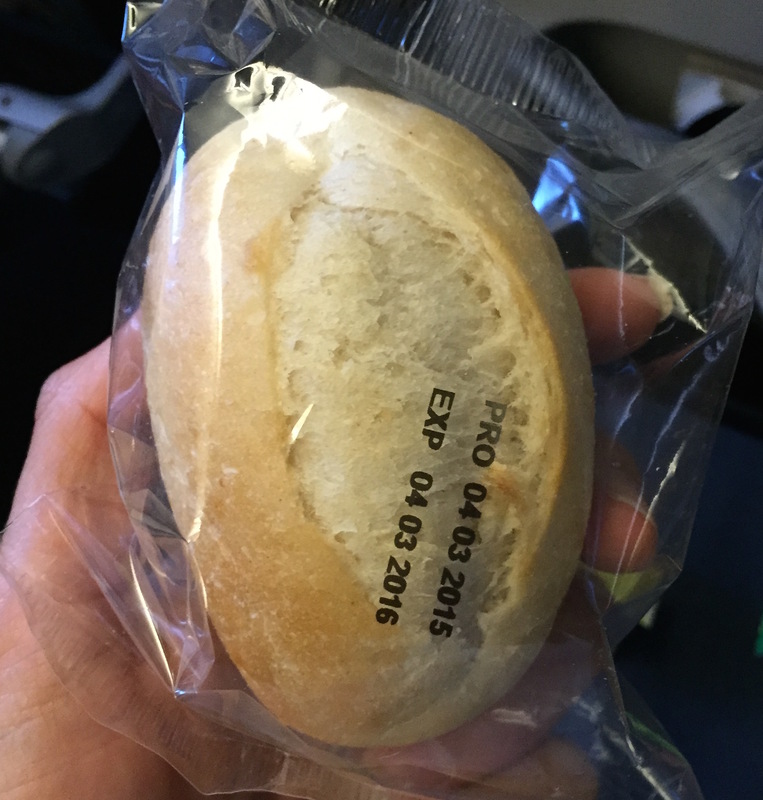 Bet the airline employs an “Accredited Practicing Dietitian” to come up with this industrial diet disaster. I always eat something prior to boarding a plane. Caesar salad, no croutons with some chicken is usually available in airports. I also bring on board snacks such as nuts. As a type 1 diabetic, this is annoying. 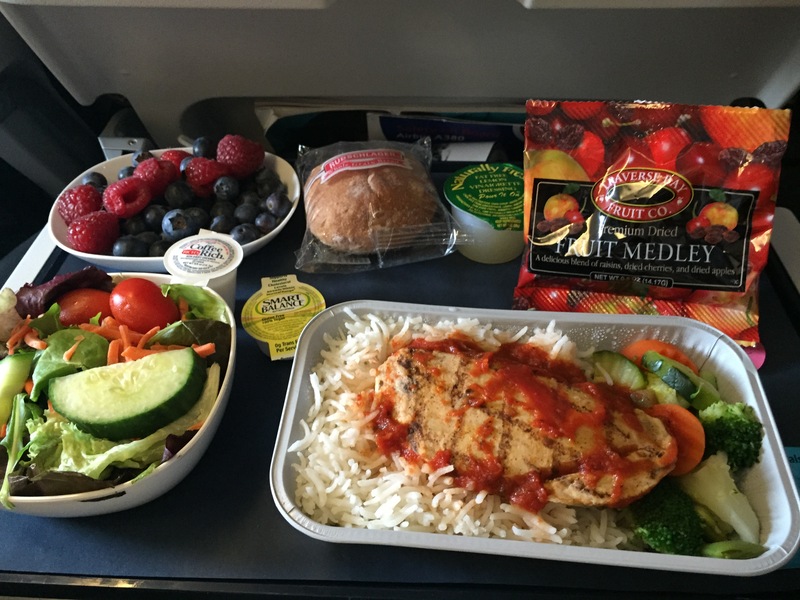 I typically just order the regular airplane meal and avoid the rice, bread, etc. It would be nice to get extra veggies vs. rice and nuts instead of the bread. However, your characterization of type 2 diabetes is not very fair. Curing type 2 diabetes is not as simple as cutting out carbs, though it can help. This link: http://diatribe.org/type-2-diabetes provides a great resource to better understand the disease. I hope you will give it a read. The road to better outcomes starts with ensuring that we all fully understand diabetes in the first place! Thanks. Hey Ilana! Thanks a lot for your input and link. Are you referencing the case in which Type 2 Diabetes is too advanced and too many beta-cells are lost for recovery to occur?